File this under “Ooh; looks interesting”. 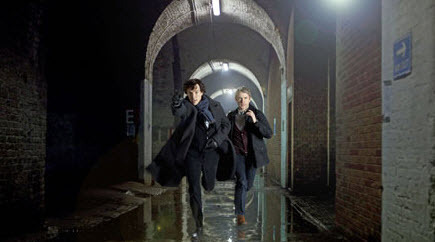 The BBC are gearing up for three new, 90-minute, Sherlock Holmes films. This new Sherlock mini-series was co-crated by Steven Moffat (in charge of the Matt Smith season of Doctor Who) and Mark Gatiss (who played Doctor Lazarus for the Tenth Doctor and who wrote Victory of the Daleks). It’s being produced by Sue Vertue – who worked on Coupling, as did Steven Moffat. Sherlock Holmes will be played by Bendict Cumberbatch and Watson by Martin Freeman (known for his role in the original The Office and the attempted Hitchhiker’s Guide To the Galaxy film). There’s a bunch of other writers on the project; including Euros Lyn who’s worked on Doctor Who and Torchwood. I wonder there will be any time travelling! The BBC say this will be an “unique adaptation” but promise the iconic details will be the same. “Everything that matters about Holmes and Watson is the same. Conan Doyle’s stories were never about frock coats and gas light – they’re about brilliant detection, dreadful villains and blood curdling crimes and frankly, to hell with the crinoline. “The fact that Steven, myself and millions of others are still addicted to Conan Doyle’s brilliant stories is testament to their indestructibility. Sound good or should these guys be keeping their focus on Doctor Who?